This year the Society's gaze turns to the north end of town; specifically, the Whiteface and Wonalancet region. With great fertile fields and abundant water power for mills, this was one of the earliest settled areas of Sandwich and was a productive and active area of town for over a century. Eventually, the needs of agriculture and animal husbandry changed, great freshets wiped away the mills and summer tourism evolved away from summer boarding houses. Whiteface returned to a more bucolic landscape, a place of rugged beauty and spectacular landscapes that it remains today. Our Auto Tour can take as long or as short a time as personal preference dictates. It can be covered in an hour or two, but we urge you to linger and enjoy the mountain, fields and forest views it offers and to contemplate the local history and the rugged people who lived here. It will show to you an interesting landscape returning to its natural state with beautiful vistas and an interesting history. The road of the main route is a paved State highway, Route 113A. The side roads are Town roads and, on the whole, in good repair. There are no public facilities or gas available along the way so plan ahead. And a reminder, that all the houses, and property, are privately owned unless otherwise noted. Where to start a tour like this is a subjective choice, but we will begin at an easily located point; 354 Whiteface Road (Route 113A) the Whiteface Station of the Sandwich Fire-Rescue Dept. This building stands on the edge of what would have been, a hundred+ years ago, Whiteface Village just south of the busy Weed's Mills. On the road you would have seen teams of oxen pulling loads of logs to the sawmill, wagons carrying grain or apples to the grist mill and, in season, cider press. From the mills, to the four directions﻿ of the compass would be coming sawn lumber, flour, cider and excelsior (a packing material made from wood). Later in the 19th century rake handles or spools for the linen mills might have been added to the mix. Local residents coming to trade at the general store or heading in to do business at the Whiteface Post Office, would be walking or driving by in a cart or wagon. 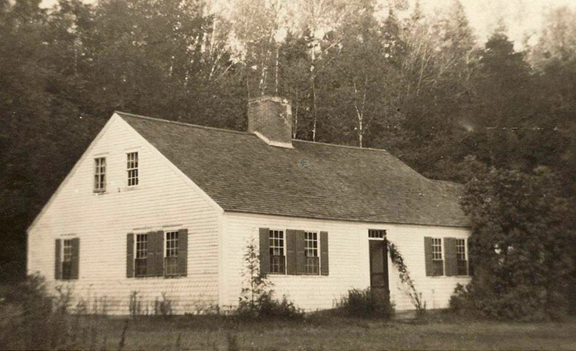 The Whiteface section of Sandwich was one of the first areas in Town to be settled. 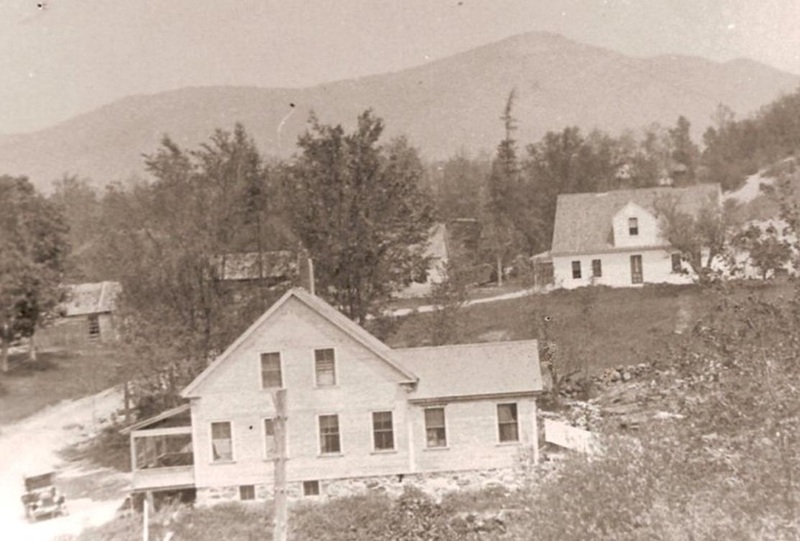 In 1776, John McGaffey came across Lake Winnipesaukee to Lee's Mills in Moultonborough, and followed the spotted path through the primeval forest to the bank of the Whiteface River in the Intervale where he settled. Two years later, in 1778 he was followed by his son-in-law Henry McCrillis, who followed the same path through the woods to settle just north of his father-in-law, at the north end of the Intervale. It is said that on his way from Lower Corner in Sandwich to the Intervale, McCrillis passed only three houses the entire way. Here, the McCrillis-McGaffey families lived for the next nine generations on beautiful, prosperous farms. 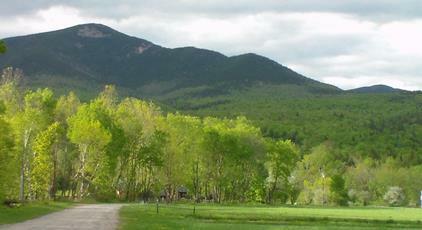 Whiteface Intervale is a classic New England mountain intervale, tucked under the frowning cliffs of Mount Whiteface. 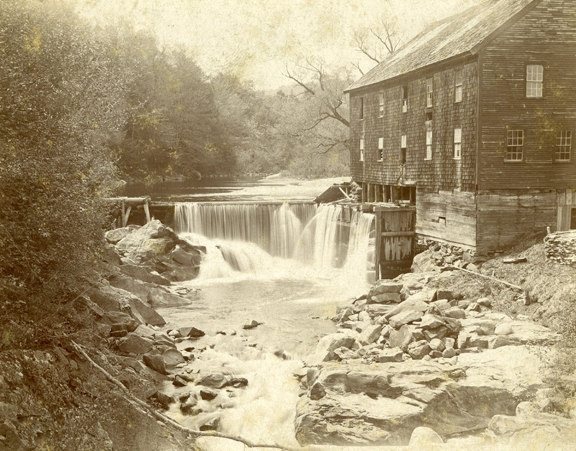 Back down at Cold River in the 1780's, Henry Weed started the first of his mill buildings, a saw mill, that would eventually grow into a series of mills along the banks of the river. Between the farms and the mills, the area drew many settlers and flourished through the eighteenth and nineteenth centuries. Summer boarders came from the cities later in the nineteenth century to spend a month or so in the clean mountain air. ê Starting at the Whiteface Fire Station, 354 Whiteface Road (Route 113A) head north. Across the street is the site of the Messiah Church (1899). The nineteenth century was an extremely religious time. Within two miles of this spot stood three different churches; The White Church, The Brick Church and The Messiah Church. Just a little further off was the North Sandwich Quaker Meetinghouse, the only one still standing. 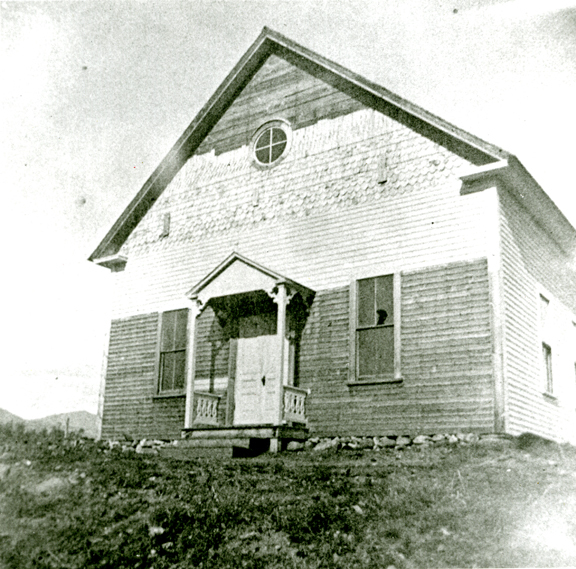 The Messiah Church was a bright flash across the dying years of the nineteenth century. Built by families who thought the Freewill Baptists at the White Church were erratic when it came to church doctrine, it was started by E.L. Krumreig who came to preach at the White Church in 1898, and had himself ordained a Minister of the Gospel later that year. He convinced the breakaway families to build a new edifice during 1899, and the building was dedicated in November of that year. Three months, later Rev Krumreig resigned, feeling his calling was now elsewhere. By 1902, it was abandoned except for an occasional funeral or service. It was still standing in 1932, but was derelict and the interior had been stripped out. At 0.1m the battered white building on the left was the Tappen Store and Whiteface Post Office for many years, run by members of the families from the two large white houses across the street. At 0.2m pass over the high bridge above the Cold River; below and to your left were the extensive Weed's Mills. Do not park in the parking area just beyond the bridge, as this is parking for the Town swimming area at the Potholes and your vehicle will be ticketed if parked there without a facilities sticker. If you can find a safe spot, park off the shoulder of the road, or park at the Fire Station and walk down. Here, on this stretch of river, in the 1780's Henry Weed started building a series of dams, sluices and waterwheels to power first a grist mill and then a saw mill. The wheel pit for the first big water wheel can be found in the woods just west of the parking area. Mills lined the banks of the river, cutting lumber with an up and down saw and grinding wheat, corn and barley. Later, a cider press was added and still later an excelsior mill. Excelsior was softwood shavings, and was used as packing material. Later, spools for knitting mills and rake handles were also manufactured here. 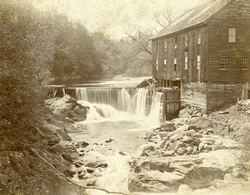 The whole complex was washed away in a great freshet around 1900. Not a timber remained. Today this is the Potholes swimming area, a town beach. On hot summer days, local residents can be found lying on the ledges and rocks, like so many tan seals, after a refreshing dip. Across the street from the parking area is a white house that Aliston Grant, longtime resident and promoter of all things Whiteface, lived in for many years. 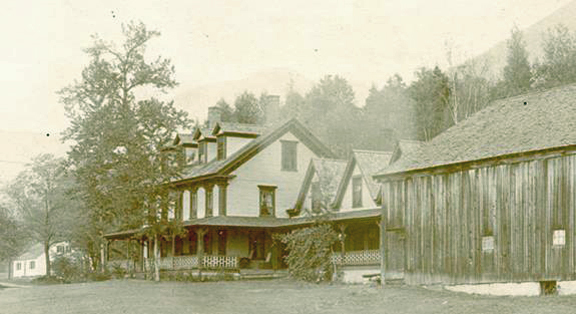 His wife was the last postmistress of the Whiteface Post Office that was located in this house. At 0.3m is a crossroad. On left is Young's Mountain Road, a very old road that, at one time, led to farms and orchards along the north branch of Cold River that were abandoned by the mid 1800's. 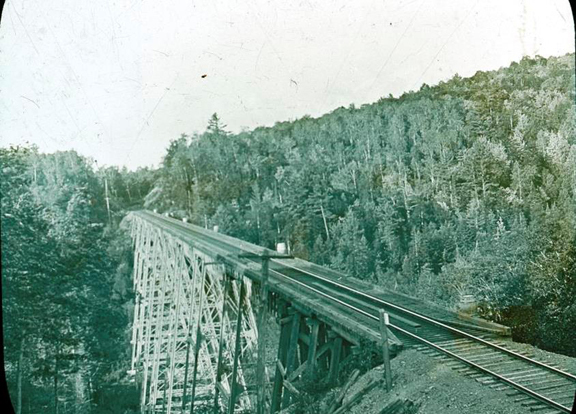 For many years the only house on this road was the white house just after the bridge over Cold River. Today there are number of newer houses along the road. 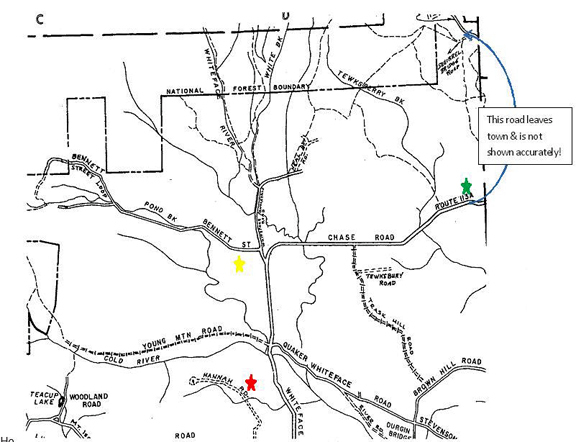 Originally, the road worked around the base of Young's Mountain and ended at the north end of The Loop (see below) but today ends at 1.8m after the road gets progressively worse. At 1.6m an old abandoned road comes in on the left from Mount Israel Road. Near here is Aunt Ruth's Spring, a cold spring rich with minerals that, reputedly, had medicinal qualities. On the right is the Quaker-Whiteface Road. 1.7m to the North Sandwich Quaker Meeting House, still an active place of worship for the Society of Friends. Meetings are on Sunday mornings. At 0.6m, continuing on the main tour, on the left was the Brick Church. Built in 1832, as the North Sandwich Congregational Church, by 1855, services were held elsewhere. The thrifty local residents disassembled the building and the bricks were used in the firewall at the South Tamworth Industries buildings. Also at 0.6m on the right is the Sandwich Animal Hospital. 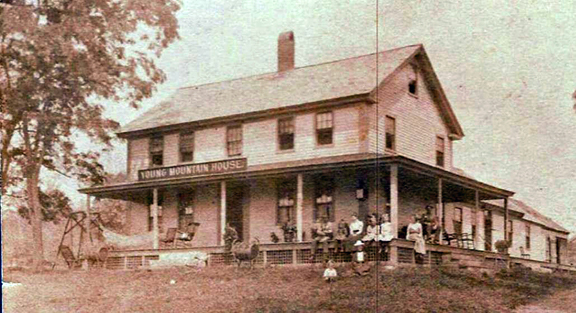 The building dates from the early 1800's and in the late nineteenth century was known at the Young Mountain House and took in summer guests. At 0.8m are the fields and greenhouses of Wayside Gardens on the left. At 1.0m is Elliott's Spring on the right. It is named for Edwin Elliott who owned the house just up the hill. At 0.1m turn left onto Bennett Street; the 1850 Whiteface Schoolhouse, now a private residence, on the corner. At 1.1m on Bennett Street on the left is the last of the spotting huts that were used by plane spotters during WWII. This hut was originally up in the Whiteface Intervale. The road turns to gravel. At 1.6m comes the intersection of The Loop, as the name suggests, looped up over the ridge and came back down, crossing Pond Brook at Jose's Bridge, and came back to this location. Today, it is a dead end road to the right that continues past old farms and summer houses. If you continue to the left here along the old road in .75m you come to a gate and parking area. Hiking trails lead from here to Flat Mountain and Guinea Ponds and Sandwich Dome. This old road, part of the old Loop and then a skid road, led to the Beebe River Railroad, active in the early twentieth century taking logs out of the Beebe River valley to the mills at Campton. Return back to the intersection at Whiteface Intervale Road. Turn left onto Whiteface Intervale Road; in 0.4m you cross the Whiteface River on a bridge just north of which the first settler in the Intervale, John McGaffey, settled. Terrific views of the Sandwich Range, and especially Mt. Whiteface, open up across the broad Intervale. At 1.0m come to the end of the town road at Captain Neal Brook and the Ambrose Farmhouse on the left. Just beyond is the old McCrillis Farm, the oldest house on the Intervale. Both of these farms were favorites with summer boarders in the late nineteenth century. Return back to intersection with Route 113A; turn left onto Chase Road (Route 113A). ê Continuing on the Chase Road (Route 113A) at 1.5m is a fine view across the Intervale and brook of Mt. Whiteface. At 3.7m cross the town line between Sandwich and Tamworth. Stay north on Route 113A. In 1.0m emerge into the delightful Wonalancet Intervale with tremendous views across the fields of the Wonalancet Chapel and the Sandwich Range. If you haven't seen this view on at least one calendar in your life, you haven't been looking. At 1.2m, at a sharp curve, Ferncroft Road bears straight ahead. Take this road and almost immediately cross Paugus Brook on a bridge and into the Town of Albany. The road follows a smaller intervale at the north end of which is a parking area on the right. Vehicles should park here as the road ahead is narrow and there is no parking. Continuing along Ferncroft Road from the turn into the parking area, at 0.6m from Route 113A cross the town line from Albany back into Sandwich. Look closely for the short granite post on your left with an "A" on one side and a "S" on the other. At this spot, on the right, was Ferncroft, a summer hotel for many years. The extensive grounds had all the amenities, including a swimming pool with water diverted from the brook. The town line ran through the large house and when it was a private residence in the nineteenth century. The brother whose bedroom was in Sandwich voted there, and the brother whose bedroom was in Albany voted in that town. Ferncroft burned to the ground in the early 1960's. At 0.7m Squirrel Bridge Road leaves to the left. A number of summer houses and cottages are located here and the Blueberry Ledge Trail up Mt. Whiteface leaves here also. About a mile up the Blueberry Ledge Trail, the McCrillis Path, a footpath, leaves on the left and follows the long ridge back to Whiteface Intervale. This path was an ancient road with as many as ten families living on it in the early years of the nineteenth century. At 0.8m the town road ends at a stonewall at the edge of a picturesque farm. 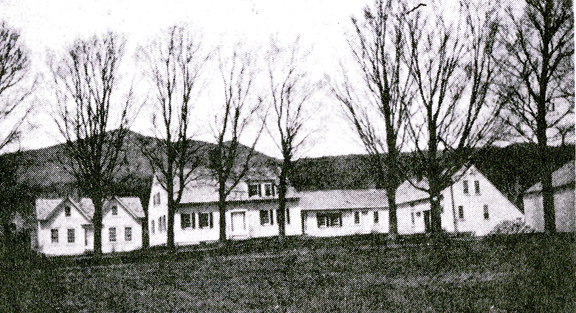 This house at the end of the road was originally in the town of Waterville Valley. A moment’s thought makes evident the problems of the farm family, who lived here to vote or to attend school. About 1850 it was set off, by an act of the Legislature, from Waterville Valley and appended to Sandwich. The Dicey's Mill Trail, a footpath up Mt. Passaconaway, starts here. This brief tour can only cover a few highlights of the history and customs of this area. More information is available in the fourth, twelfth and thirteenth Annual Excursion Bulletins of the Sandwich Historical Society available for purchase online at www.sandwichhistorical.org or at the SHS Elisha Marston House Museum at 4 Maple Street in Center Sandwich, NH. Thanks to Jim Mykland for researching and writing this tour and Jim Hambrook for mapping assistance.